After student teaching in local classrooms for 10 weeks, 11 seniors in the College of Education spent five weeks in classrooms in China. There, the students say, they developed a deeper sense of cultural awareness and competence that will help them better reach their future students. Abigail Shoe had no desire to study abroad. But a few of her classmates in the NC State College of Education’s elementary education program were interested in student teaching in China. She looked into the program and learned she could complete 10 weeks of student teaching in a local classroom and then five weeks in China. She realized it was the same study abroad program her cousin had completed four years earlier at UNC-Chapel Hill. Her cousin encouraged her to do the same. 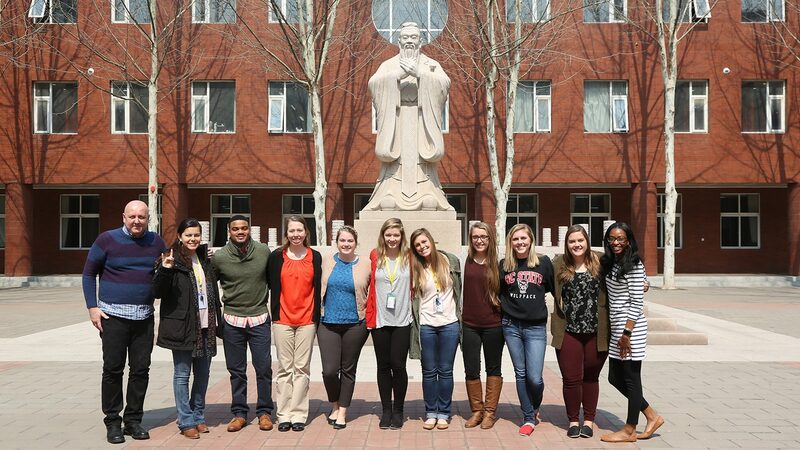 During their student teaching abroad experience March 25-April 29, 11 College of Education seniors shadowed Beijing Royal teachers, engaged in classroom observation, student taught, and immersed themselves in the culture. They experience the traditions of Beijing and surrounding areas through meals, interacting with citizens, and visiting historical and tourist sites. 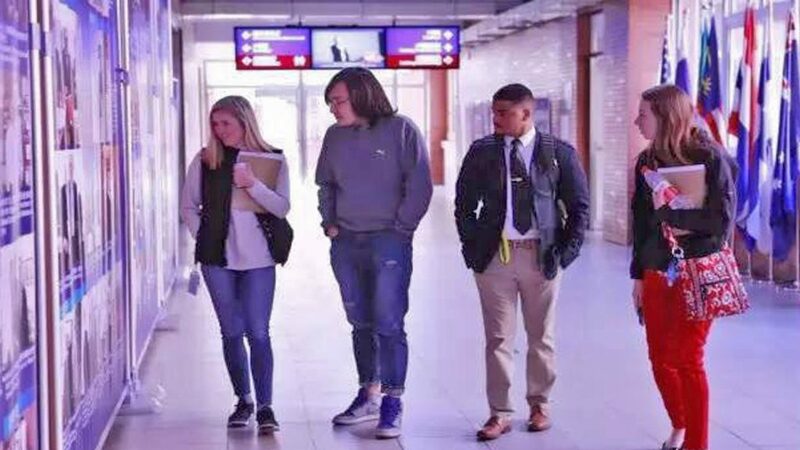 We spoke with four students who participated in the trip about their teaching experience in Beijing and how lessons learned there will carry over to their classrooms. Beijing Royal School is a private boarding school that places much of its focus on business rather than individual education. There is not a determined curriculum for the school as a whole, and students are separated based on the amount of English to which their parents want them exposed. The class that I am in is an ESL class where the primary homeroom teacher is from the U.S. and speaks only English. There are, however, four other grade two classes that are bilingual, where the English-speaking teacher teach them one or two periods per day. The official school day runs from 7:40 a.m. to 5:30 p.m. with an hour-and-a-half lunch break where the entire campus is expected to nap. At 6:10 p.m., after dinner, students report back to the classroom for an hour-and-a-half of tutoring and study hall with their homeroom teacher. This is very different from the 8:30 a.m. to 3:45 p.m. school day I am accustomed to in North Carolina. This experience has definitely impacted my ideals and beliefs as an educator. I have learned more effective ways to teach ESL students, which I believe can determine their success in the classroom. Being immersed in a Chinese school but presenting lessons in English introduces the teacher to different teaching strategies that can meet these students at their instructional level. These kinds of experiences are beneficial to me as an educator, as they help develop a sense of cultural awareness and competence that helps reach all students and their families. Beijing is so different than anything that I have ever been exposed to in the U.S., and I broadened my perspectives and preferences to fully embrace a new, exciting culture. Having spent time in China previously, I was excited to hear that NC State was going to be offering a student teaching abroad program in the country. I have always enjoyed working with students who are trying to learn English, and I was so excited to have the opportunity to do that in China. Anyone who is able to, should travel outside of the U.S. to experience other cultures, gain new perspectives, and connect with someone who comes from a different background. During my student teaching I was able to focus on how to make lessons more engaging for students. Game-based language learning is really effective for students learning English, so I focused on incorporating that into my lessons. Even when traveling away from my student teaching at Beijing Royal School, I learned so much about China. My favorite experience was traveling to Shanghai for the weekend. We were able to experience more of the Chinese culture and see another exciting part of China. Immersing yourself in another culture for five weeks will definitely change you. I decided to complete my student teaching in China to see how another country educates children. I was particularly interested in different types of management and teaching strategies and wanted to see these firsthand. I also wanted to become a more culturally aware educator. Part of this cultural awareness came from learning how it feels to be an ESL student. My first week, I was placed in a classroom where no one spoke English. This helped me realize how frustrating and scary it can be for students who are coming to the U.S. from another country and do not know the language. This will help me determine best practices for helping students learn and understand concepts in a new language. Language differences aside, getting to know my students was extremely rewarding. They were sweet and understanding, and helped me practice my Chinese. It was amazing to feel love for students even when there are language differences. Overall, my experience taught me the importance of researching different cultures. You need to find out the why behind certain practices, understand cultural history, and accept differences. While in China, one of the differences I noticed was that material is presented differently to the students. In the U.S., we are moving to more student-led learning where students are working through discovery tasks, conducting investigations and using technology in the classroom. In order for Beijing Royal School students to come to the U.S. to study, they must pass a number of tests, therefore the learning in the classroom is directed by these tests. We want students to have a conceptual understanding of the material in addition to a procedural understanding. We also want students to understand the concepts behind the procedures and to be able to explain the material in their own words. Another difference is the collaborative learning in the classroom. A majority of the learning there is done independently. The students have conversations with the teacher during lecture but the students do not have group or pair discussion throughout the class. In the United States, my students were continuously working in groups to better understand the material. In addition to observing the differences in collaboration, I learned what it was like to sit in a classroom taught in a different language than my first language. During these five weeks I observed a math classroom taught mostly in Chinese, and it was difficult. As a math teacher, I understood a majority of the concepts my teacher has been teaching, but I did not know anything he said to students about content or classroom management. This provided me with the opportunity to put myself in the shoes of my future students who do not speak English as their first language. I am better able to empathize with these students and I believe it will drive me to put more effort into meeting their learning needs in my classroom.